I wrote this article last year but with the season to use this bait fast approaching I thought it would be appropriate to use it again. This month I will be talking about a bait that has been around since the early '70s. 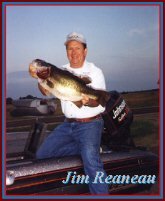 I can remember on Lake Conroe one afternoon when a gentleman came in with a case of rattle trap's and set them on the counter. He told the proprietor of the Marina to distribute these baits to his guides and his local fishermen. Since that day the rattle trap has made a drastic change. I can remember that someone left a rattle trap on the dash of their truck and from the heat of the sun the bait swelled. With the chamber being a little larger the bait gave off more vibration. There were people boiling them in hot water trying to get the bait to expand. Soon there were many baits that copied the ever popular rattle trap. The best way to describe this type of bait is to call it a lip less crank bait. During the month of January, February and March you can take the rattle trap and cover a lot of water from the bank out to fifteen foot of water. You can actually throw a rattle trap year-round. I have never seen a bait that will get bass to strike at it in 46 degree water. I have thrown a multitude of baits in cold water but none has ever drawn the strikes that the rattle trap does. I have slow rolled spinner baits and crank baits, flipped jigs in this cold water and none surpass the rattle trap. On Lake Fork, the red crawfish pattern bait is the most popular during this time of year. To work the rattle trap effectively, you need a high speed 6.1 ratio reel and a medium heavy rod with 15 to 20 pound line. If you use one of the slower retrieve reels, it will wear out your arm. There is an art to fishing this bait. When fishing grass I like to tick the top of the grass and rip the bait up and let it fall back down. Be prepared as the bait is falling back to the mat as that is when most strikes will occur. Sometimes the bite will feel like a slight pressure or as if you have picked up some grass. You will have to be on your toes to detect these strikes. As the water warms the strike will become more pronounced. Another technique is to fish the bait through timber and periodically run it into the standing timber and stall the retrieve and start again. Also, run the bait through limbs and over logs. As the bait passes over the structure let it fall and start again. The strike will normally occur on the fall or just as the bait starts again. Size and color is another area you will have to experiment with. Some days a 3/4 ounce is best and on others a 1/4 ounce is best. The trap has two hooks on it and I normally change these hooks as soon as I take the bait out of the package. I like to use a little stronger hook. Sometimes I change the belly hook to a larger size which helps to hook more fish. The trap is well known for being thrown free while fighting fish. Normally I use this larger hook around grass more than timber. When fishing in the timber or very shallow water this bait has a tendency to hang up a lot. Once you realize you have hung the bait and it is not a fish, don't whip or bow your rod by pulling on it. This will load your rod just like you were drawing an arrow on a bow and should the bait come loose it will come back at you at twice the speed of sound and with those two treble hooks, look out! The worse part is it may miss you and hit your buddy or the worse case scenario, the guide. MERCY! To be serious, when you retrieve your trap and it does hang up, don't jerk on the line but drop slack and shake the rod tip loosely. If this does not dislodge the bait try the old banjo trick. Disengage your reel, get enough line to wrap it around your hand and leave slack. Grab the slack with the other hand and pull it taught and release it as if you were plucking a banjo. Sometimes the slack line will shoot towards the bait and shake it loose. It is a lot easier to show someone this trick than put it in print. If you are using braided line, I don't recommend wrapping it around anything that I want to keep intact on my body. Get yourself a stick and wrap it around that. If there is one thing about fishing a rattle trap that I want to impress upon you it is to be careful. As I said earlier, a fish can shake this bait free in a matter of seconds and it can come screaming back at you like a bullet. It is funny how the fish can get away but if the bait hangs on something it is there for life. I always said if I were going to fly on an airplane I would take along a couple of rattle traps because if the plane was going to crash I could jump out and the traps would hang on something before I hit the ground. I hope this will help you to catch some winter fish.